Starting out the new week with a funded Kickstarter campaign and 10 more days to go! So many things to get ready, printers to source, files to finish and many future ideas swirling around in my head. P.S. There’s still time to jump on the bandwagon. Click on the image below! Yes, it’s true. We are one week into the campaign and already 75% funded. This is extremely exciting considering the length of time it took to fund the last campaign without actually reaching the goal. Although, this is a wonderful start we are truly not done yet. The funding has slowed down considerably, which I am told it always does the beginning of the second week. So, I hope that we can make this project a reality and hit a home run. Remember, if this campaign exceeds expectations every backer reward will come with some amazing extras. Thanks for all the help, sharing and support. Second Round Kickstarter Campaign Up & Running! It’s true, we’re back. 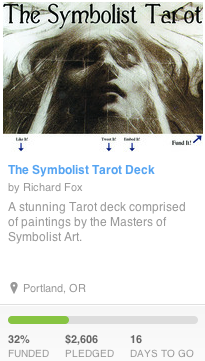 Yesterday I launched the 2nd Round of the Symbolist Tarot campaign. After falling short the first time around, I decided that I would do a little more research, streamline the backer rewards and start over. Well good news. Thanks to interest and support the new campaign is off to a cracking good start. As of this writing we are 41% funded and the campaign hasn’t even been live for a full 24 hours. This is amazing. I will be blogging, tweeting and facebooking this thing all the way to the end. Stay tuned for new cards, more information and some exciting future events. So, there are now 7 days to go on Kickstarter. This morning, the 50% mark had been exceeded. This is where the magic happens. The final days tend to be fun and exciting on campaigns. Let’s hope so. My tarot card reveal for the day is the Three of Pentacles, a card that represents teamwork and collaboration. Perfect way to start out this final week of fundraising. Please share this project, card image or whatever you feel. Have a great weekend, Richard. Hey Everyone or anyone who’s reading this. The campaign has 8 days to go. I will be revealing more cards, tweets and blog posts before this is over. Please share, like, enjoy, back or cheers from the sidelines. 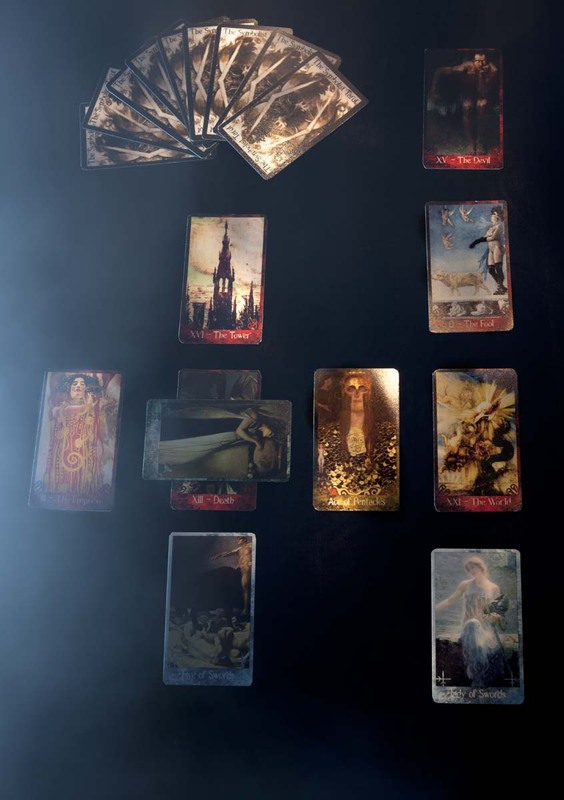 I really thought this image played well with the “Damned if you do, Damned if you don’t” divination of the Eight of Cups. In reality, if Ulysses is set free he will drown and be killed by the Sirens but their mesmerizing song promising love and paradise makes him weep with regret and sorrow when he is unable to join them. I am including the duo of cards, the Empress & Emperor, numbers III & IV respectively. I was really drawn to both of these paintings for different reasons. First off, the Empress has so much power in this image. Here I portrayed her as the goddess of health, Hygeia. 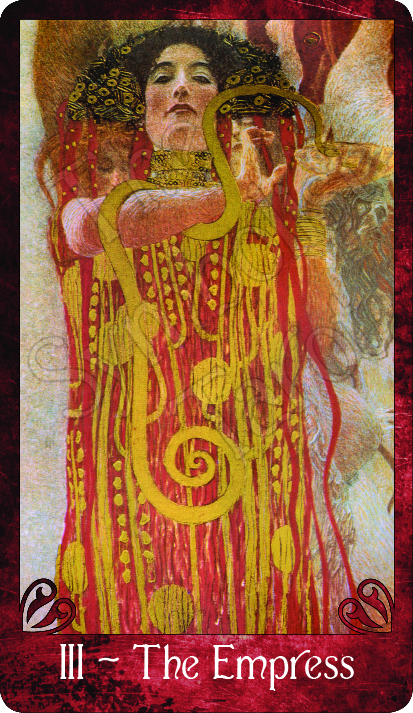 The Empress is usually viewed as a nurturer, mother, sometimes pregnant and always powerful. This image spoke to me. Second, the Emperor as Jupiter (Zeus). I kept with a more traditional image for this card. I am really drawn to Moreau’s work and thought this image was perfect. 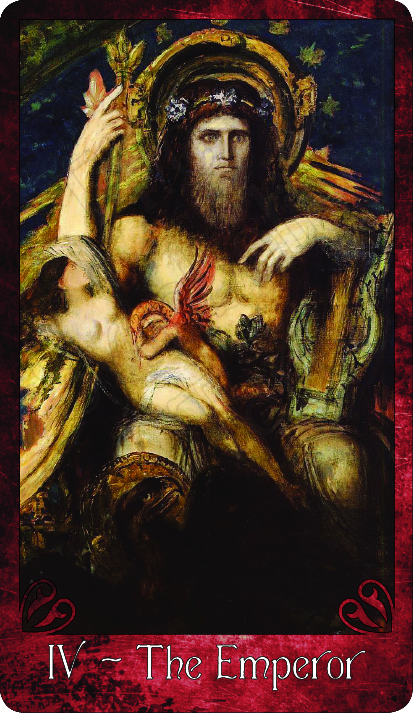 First off the art, Gustav Klimt & Gustave Moreau, well that’s serendipitous isn’t it? Just realized that as I was typing.